The Memphis Grizzlies will have a new court, new logos and new uniforms next season. MEMPHIS, Tenn. — Simply redesigning uniforms wasn’t enough for the Memphis Grizzlies. They seized the opportunity to change so much more. Everything from logos to color schemes to the way their court at FedExForum will have a new look this season, part of the team’s most significant reimaging since 2004. Memphis has revamped its on-court look for the 2018-19 season. All that and the Grizzlies also added FedEx to the jersey as the team’s corporate sponsor. The unveiling ceremonies Thursday night at FedExForum for the media and key fans even included a FedEx courier delivering packages containing the new jerseys. As for Conley, often on the cutting edge of fashion, also gave the uniforms a nice review: “My professional opinion is I look great,” he said drawing laughs from the crowd. The uniforms are primarily darker blue and white, and the Grizzlies kept a baby blue known as Beale Street Blue “statement” uniform in the mix. The team’s grizzly bear logo adorns the side of the darker blue uniform shorts. 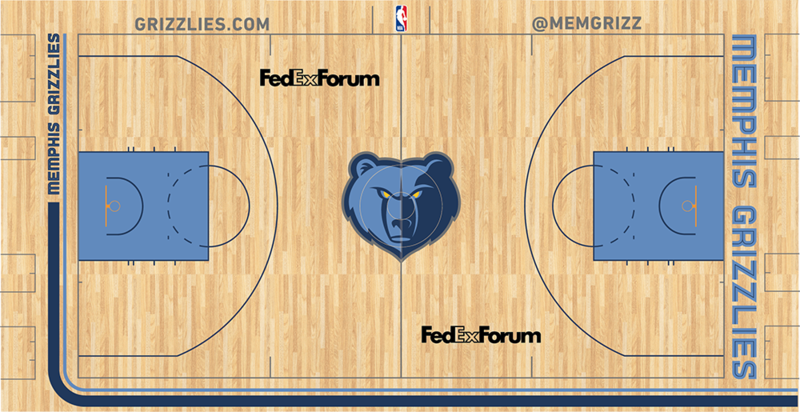 The Grizzlies' home court at FedExForum will have a new look next season. All of the uniforms have a blue collar representative of the team’s grit-and-grind characteristics, a mentality the Grizzlies hope to resurrect this season. Among other changes were logo characteristics, including outlining the main grizzly bear head logo in “steel gray” to accentuate the fierceness in the bear’s eyes. The team’s claw ball emblem was rotated where the three middle claws around the ball now form an M for Memphis. The court now will feature planks going side-to-side rather than the length of the floor. Adding a partnership with FedEx, headquartered in Memphis, seemed natural, said David J. Bronczek, president and COO of FedEx Corp.
“When you have the FedExForum and you have the Grizzlies, it just makes sense to have FedEx (on the uniform),” Bronczek said.